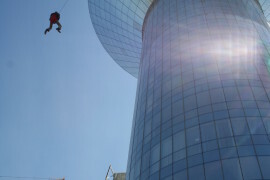 Resq-Life is a rescue descender for evacuation of people, their wealth or even small animals. You can use it in highrise apartments, dormitories and hotels in case of any emergency situation – especially when all evacuation routes are under threat of fire or even terror attack. You do not have to be specially instructed or physically trained to use the this rescue device. Of course, after instalation we show everything to the Client, but the device is so simple that You could intuitively feel how to use it. Resq-Life device can be used by people with weight from 20 kg to 200 kg range. 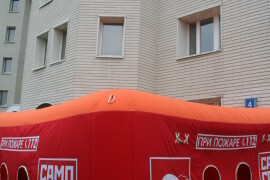 This device can be used in all weather conditions (snow, rain, strong wind), virtually any temperature: -40 to +50 0C. 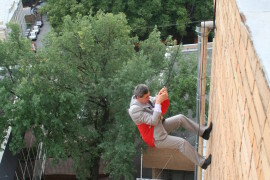 Evacuation device is used with climbing alpinistic rope made of polyamide rope with a steel core. Core diameter 4,2mm. RESQ LIFE works in principle of scales. 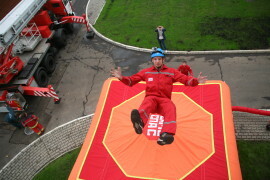 When first person is safely going down, second empty „rescue bag“ gets up from ground and goes up. It’s ment to evacuate the next (pending) person. In this way, you can evacuate almost unlimited amount of people wanting to leave the dangerous area. 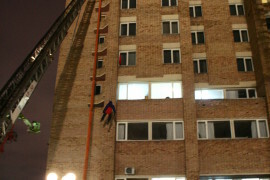 Although we count that there should be 30 people counted for evacuation with 1 rescue descender, if the height does not exceed 20 m. Bigger heights should be calculated separately by our fire safety designers. 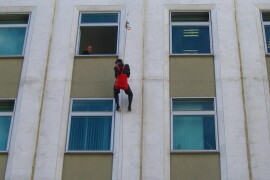 „Rescue Bag“ – special „short trousers with braces“ more comfortable for the descending and is reliably connected to the climbing rope. 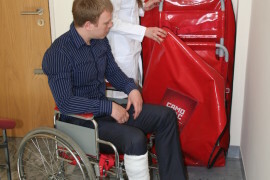 „Rescue bag“ is made of extremely durable material with armed stitching connected to the device. 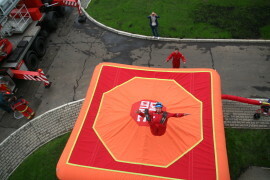 „Rescue Bag“ can withhold tearing force of over 1200kg load. 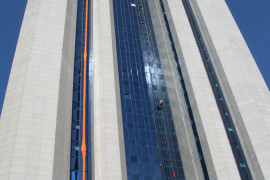 Core of rope withstands tearing force of over 2200kg and together with the „device“ itself meets all the requirements of European Union standard EN-341. 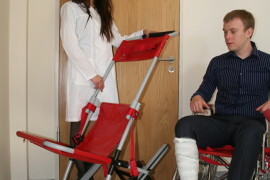 Resq-Life-Chair is created for evacuation of mobility impaired persons in emergency situations. Its ability to slide the stairs enables for quick and easy evacuation of those who need more attention. The Resq-Life-Chair has an easy fold out two wheel trolley which allows for flat surface stability. Even with this stability, passengers should never be left unattended in any evacuation chair. Healthy person can descend stairs at normal walking speed of 0.75m/s. An evacuation chair should be able to match this without jeopardizing safety. 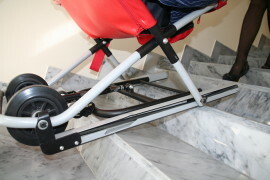 Resq-Life-Chair can safely descend two flights of stairs in 15 seconds without blocking the stairs for other users by using the Polymatic v-belt as a friction breaking device. This system uses gravity and the leverage of the operator to create friction and stop the chair. 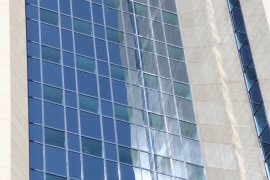 Building regulations require a 1.20m width of stairways, halls, and landings. Resq-Life-Chair is able to maneuver these areas with ease. Weight is a major factor, particularly if the evacuation equipment needs to be carried to the passenger, or simply removed from its securing location. Since Resq-Life-Chair requires only one operator, the chair is light enough to be lifted by a single individual yet strong enough to support the average passenger. Resq-Life-Chair is only 9 kg weight and has a carrying capacity of 180kg. 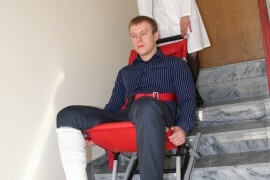 An evacuation chair must be designed for easy transfer. People of reduced mobility may require assistance, thus Resq-Life-Chair is stable, low, open on both sides and provide passenger safety at all times by not moving during transfer.